The Preamble to the United Nations Charter is the opening (preamble) of the United Nations Charter. 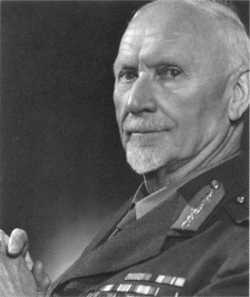 Jan Smuts originally wrote the opening lines of the Preamble as, "The High Contracting Parties, determined to prevent a recurrence of the fratricidal strife which twice in our generation has brought untold sorrow and loss upon mankind. . ." which would have been similar to the opening lines of the Covenant of the League of Nations. After considerable argument at the United Nations Conference on International Organization, held in San Francisco, Virginia Gildersleeve was successful in changing and shortening the Preamble, however, with much of Smuts' original text reattached at the end. 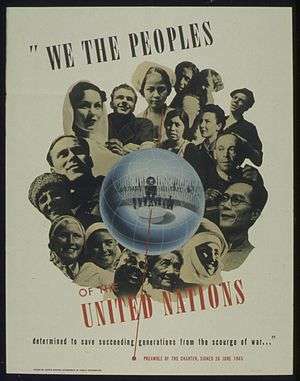 The opening phrase "We the peoples of the United Nations .." echoing that of the United States Constitution, was suggested by US congressman and Conference delegate Sol Bloom. 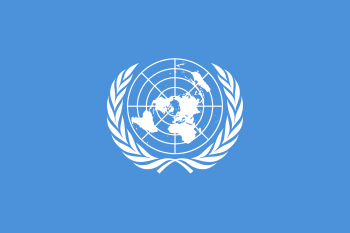 The preambulatory phrase "In Larger Freedom" became the title of a UN reform proposal by the seventh Secretary-General, Kofi Annan. ↑ Rosalind Rosenberg (Summer 2001). "Virginia Gildersleeve: Opening the Gates (Living Legacies)". Columbia Magazine. 1 2 Schlesinger, Stephen E. (2004). Act of Creation: The Founding of the United Nations: A Story of Superpowers, Secret Agents, Wartime Allies and Enemies, and Their Quest for a Peaceful World. Cambridge, MA: Westview, Perseus Books Group. pp. 236–7. ISBN 0-8133-3275-3.